Look at this lovely lady! 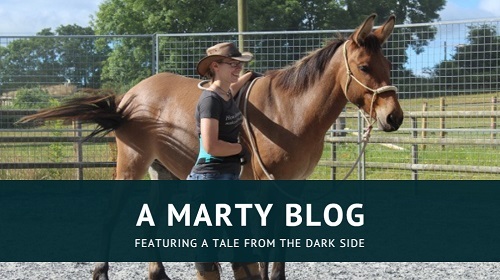 I couldn’t pass up an opportunity to learn more about Missy the short-eared mule. Her lucky owner, Denise, lives in America but spent five years in the UK where she learnt to drive horses and owned a couple of our fantastic native breeds. She fondly recalls a childhood spent having fun and exploring with her pony – something that induces a lot of nostalgia in me, too! 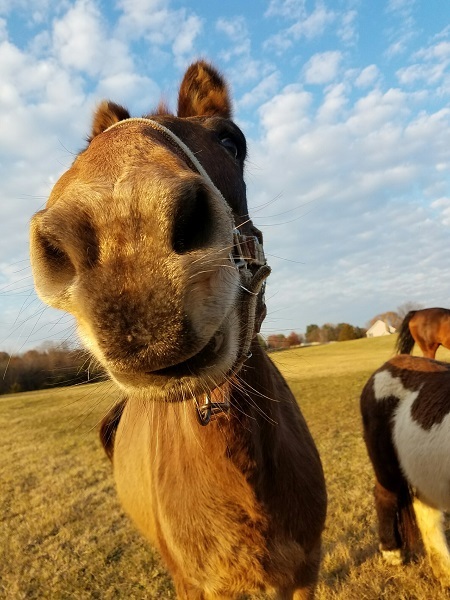 This is Missy the Mule! Missy is a 15 yr old brown/dun molly who stands about 14 hands. Breeding unknown. Born on Old Rag mountain in Virginia and used primarily as a trail mule in the Appalachian mountains. She is a been there done that mule. She is not spooky; has had barking dogs and herds of running deer go by us on trail. 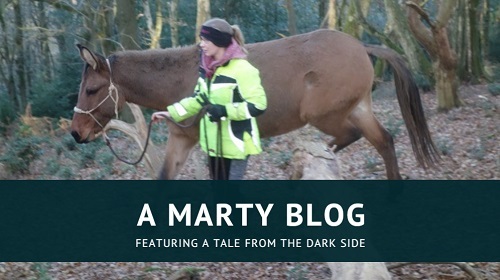 Only thing she got scared of was a big stump … stopped, snorted, and we walked aaarrround the scary stump. She loves her treats of peppermint candy. Sometimes if you are not paying attention she will grab one from you then take off running … she doesn’t go far but plays this silly game. She is great for farrier, but does NOT like vet … last time he gave her a shot she took off with the needle in her neck and ran around the field squealing! She is good with the grandkids, and my husband (who is not a horse or mule person … loves to look at them but doesn’t ride … helps me with chores, though!). She will push me sometimes to see what she can and can’t get away with. Hard to stay one step ahead if a mule! I met her about a year ago in a field on a cold winter day. Not sure why I was buying a mule in the middle of winter! She was kinda plain, and had short ears … hmmm? When I asked about her ears I was told she was born outside in a blizzard on a mountain, and the tips got frostbitten and fell off. I guess most other prospective buyers had walked away at this point, but I felt she would fit right in with the rest of my misfits. I have a rescue dog, 4 rescue cats, a 20yr old Tennessee Walker mare named Lucky, and a 30+yr old Shetland pony named Oreo. So, Missy was delivered to me several days later after a brief snowstorm. 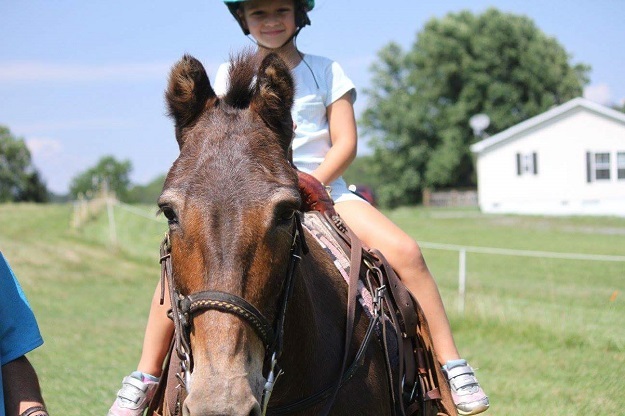 She did fit in well … loves my mare … tolerates the pony. I don’t have anyone to ride with so I go it alone. 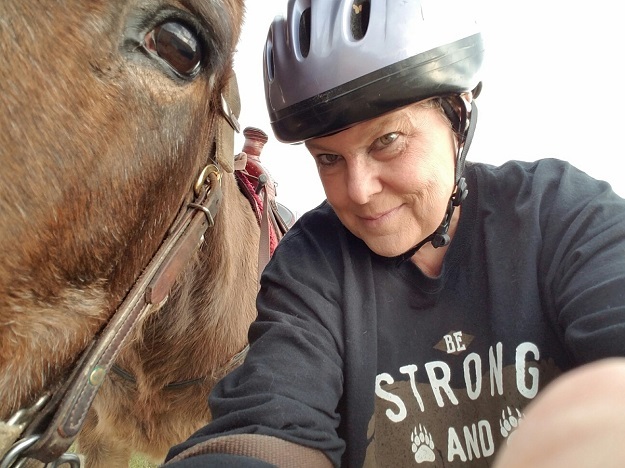 For about the first 5 months I rode in my pasture or just outside my pasture in sight of my mare. About 4 months ago I started getting brave and venturing further and further away. To my surprise Missy is great. Yes, a little herd bound, but with some firmness (tough love) she and I have been enjoying rides along the Shenandoah river. I feel a bit guilty because I hardly ride my mare anymore! Never would have thought I would be riding a mule! 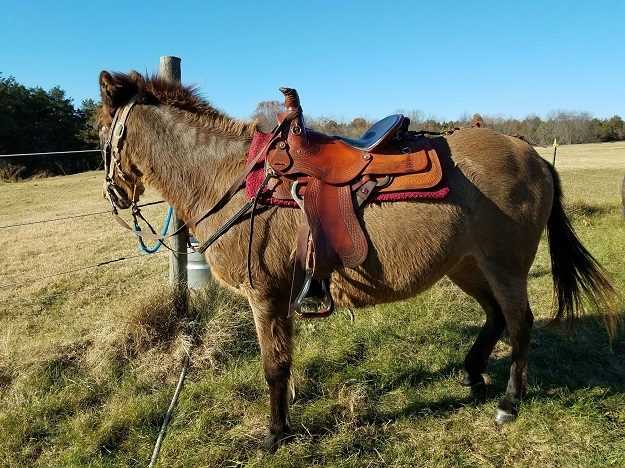 This is my first mule, after owning horses for over 30 years. I had always wanted one and had been reading up on them. Amazing how different they are from horses; some ways good, some ways not so good! We have bonded well, but I believe the mule bonding process is a continuous thing … you gotta keep at it and keep reinforcing. I still have much learning and bonding to do with Missy girl, but I love her. She is the first one to greet me in the field. I do give her treats! If I had to give anyone advice about mules I would say “do your homework first … read everything you can about them before you buy”. I would not really recommend mules if you have no horse experience first. Be prepared for how different they are from horses. Keep working on your relationship … some days you may feel like it is two steps forward and one step back. But when they look at you (and they are ALWAYS looking at you) with those inquisitive brown eyes and those long (or short) ears, you will smile and your heart will be happy, and you will have to give them a big hug … whether THEY want one or NOT. Way to go cuz. Your mom always blamed me for you loving horses. 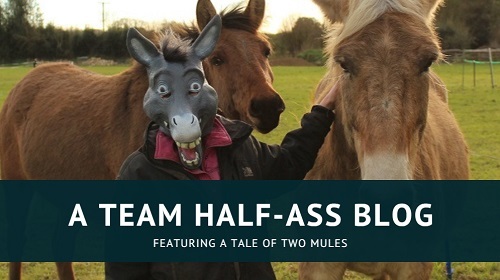 It did make me chuckle I was given a mule (short, fat, hairy one) 18 months ago and ignorantly thought they operated like my horses… how wrong Don Pedro taught me some very hard lessons one being how to grass ski face down! We are slowly getting a relationship, it did not help he has been left to his own devices for the last 8 years, so has very strong opinions!